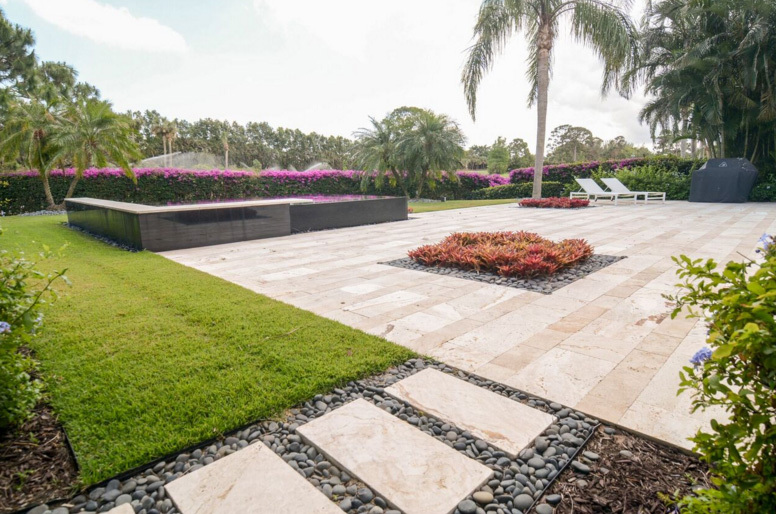 Modern Paver Design: At Apex Pavers and Pools, we turn your ideas into reality! Many of our customers bring in photos from Houzz, Pinterest and images from a Google search to their consultations. This makes the design select process easier since these images are an insight to your personal style. We’ll be able to show brands and materials that are in line with your personal taste. Unique paver designs like the one shown above uses modern design applied to a classic stone material. Mixing the travertine stone with river rock in the walkway supports the modern design. The planters placed offset in the middle of the patio inserts interesting color and dimension to the backyard space. Natural stone is great for outdoor use. Most customers are surprised at the low-maintenance of natural stone for patios, pool decks and walkways. 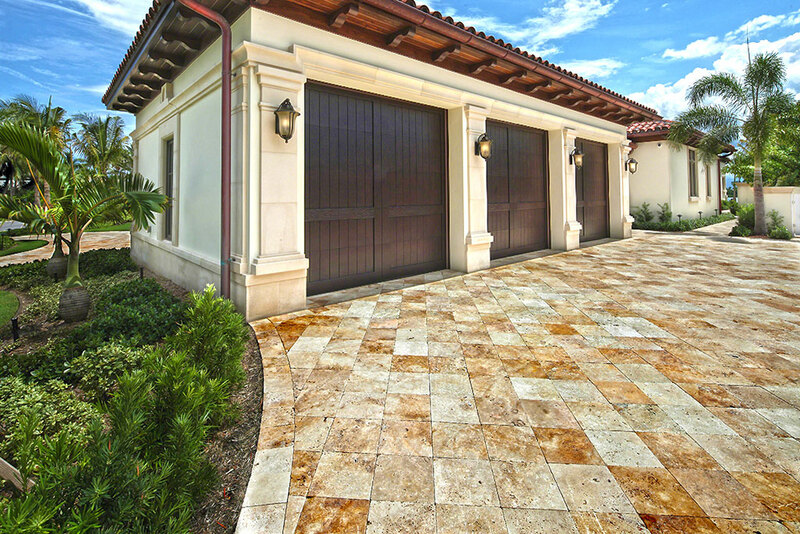 Usually, a high pressure wash is just what’s needed to keep the travertine pavers looking good year-round. Contact our design specialists today to make an appointment or visit our contact page to send an email. We invite you to watch our video below to see our most recent custom pool and paver projects. Our portfolio can also be found on our YouTube Channel, Apex Pavers & Pools. We offer custom design services for our residential and commercial clients. Please contact us for a complimentary consultation. We look forward to hearing from you! 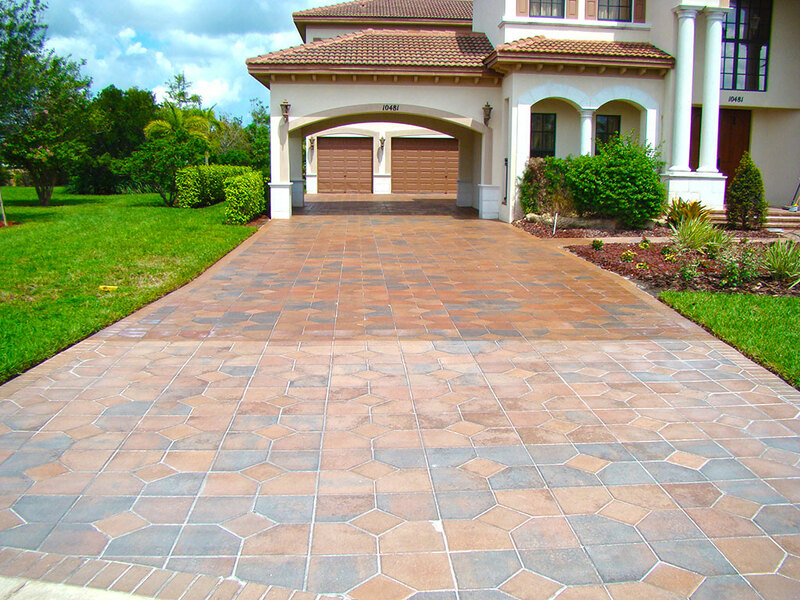 If you’re looking to increase the value of your home, consider a paver walkway and driveway. Investing in a paver hardscape is a well-documented feature that is a sure-fire way to not only enhance your home’s curb appeal, but the overall appraisal of your home as well. There are several options to be considered when upgrading the hardscape of your home. While stones, mulch and other materials certainly function nicely, using them in conjunction with brick walkways and driveways is the best way to increase the impact of your curb appeal. Concrete pavers also allow your yard to have an organic feel. Design your hardscape to curve around trees, add a focal point in your backyard, or create additional parking space to your driveway, adding instant value to your home. While an increase in value is important to your home investment, proper maintaining will ensure that your hardscape and surrounding landscape will protected for years to come. Sealing your pavers will help protect against stains from automobiles and organic material. Fixing broken pavers or filling displaced sand is imperative to protect your hardscape investment. 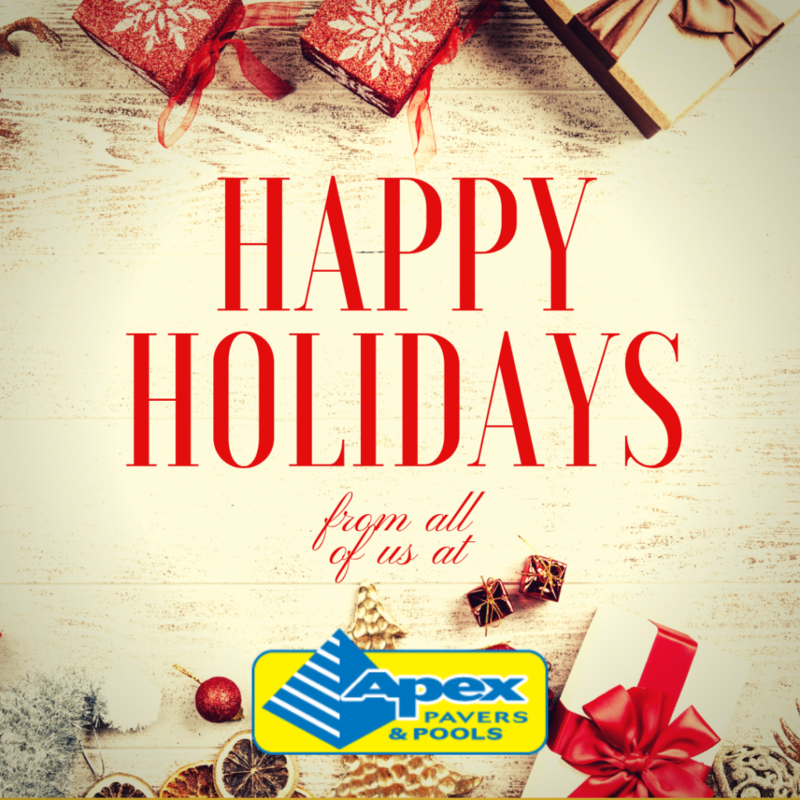 Apex Pavers & Pool can design, install, protect and maintain your new or existing hardscape surface. Contact us for a consultation today!